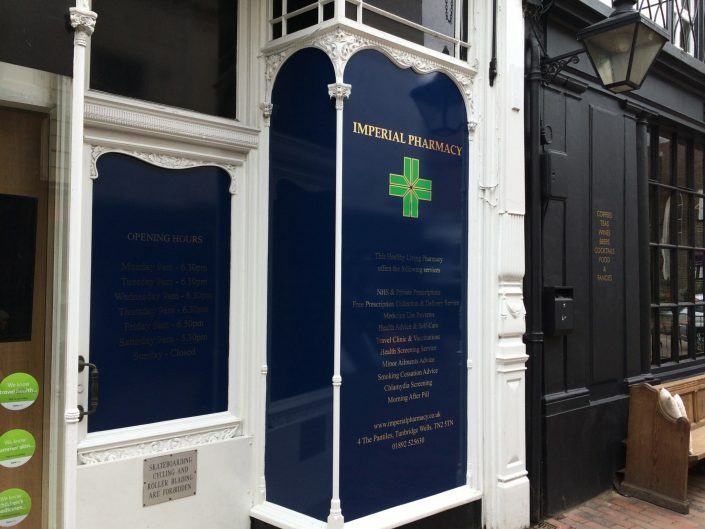 Mood Signs Ltd have become specialists for bespoke signage in many industries, but without question, the Pharmaceutical Industry is a sector our reputation has made us the envy of our competitors. 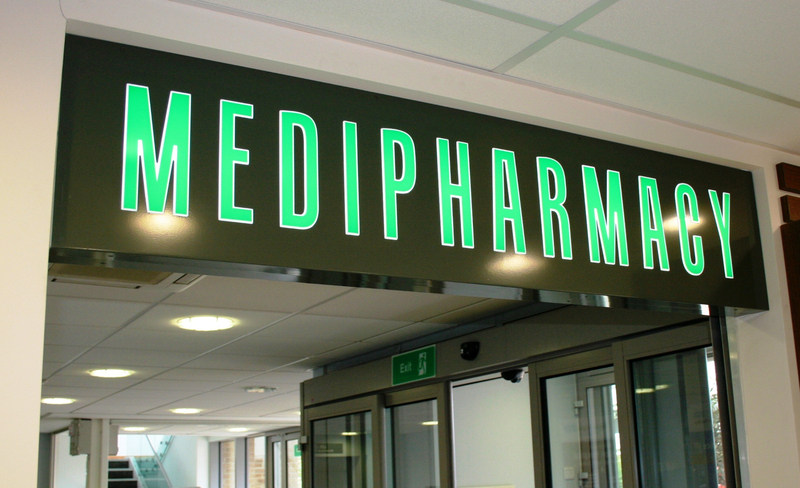 In 2018 Mood Signs were approached by the National Pharmacy Association. 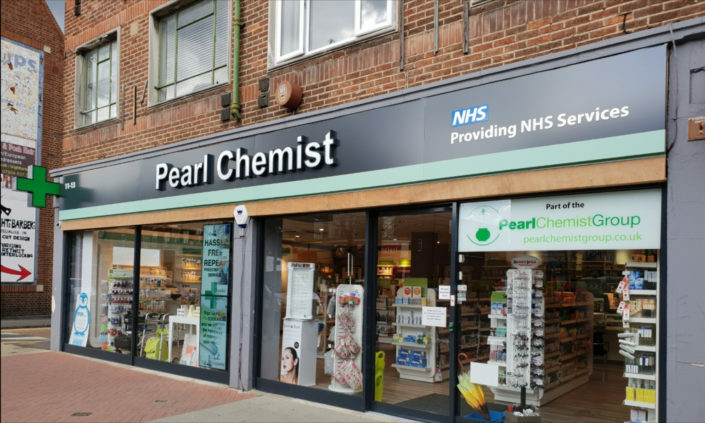 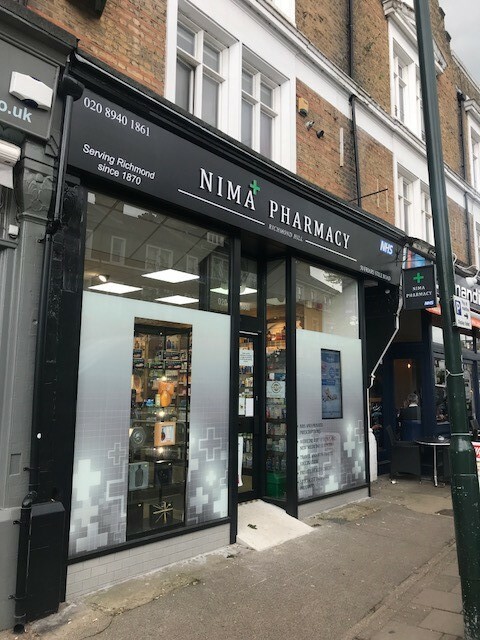 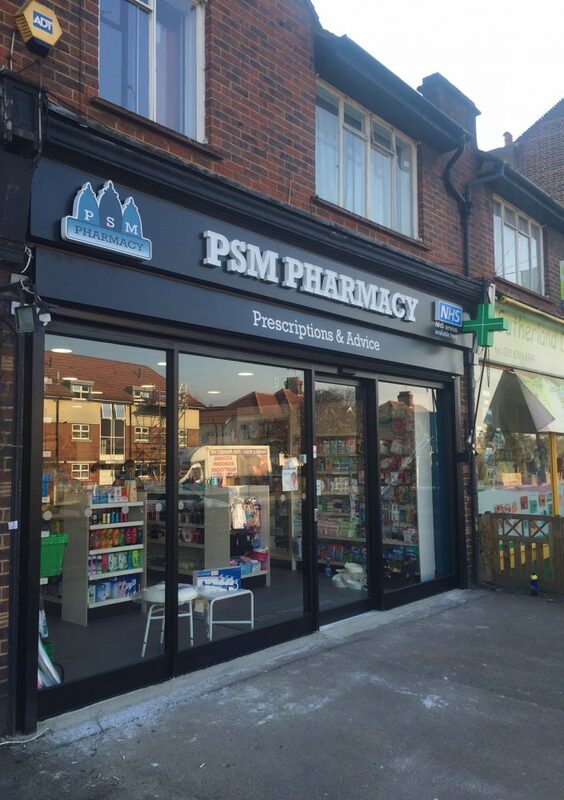 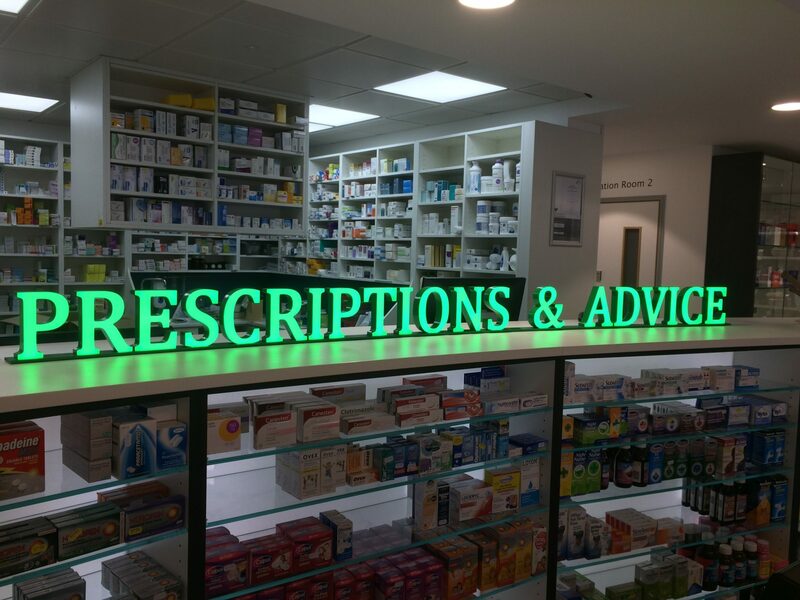 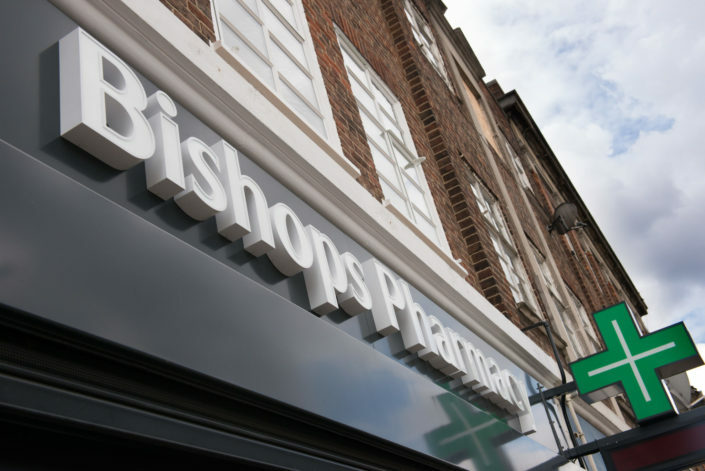 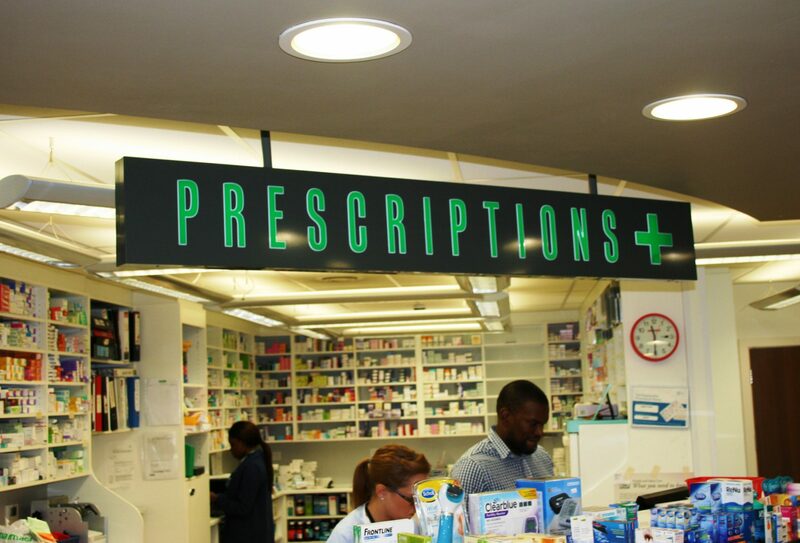 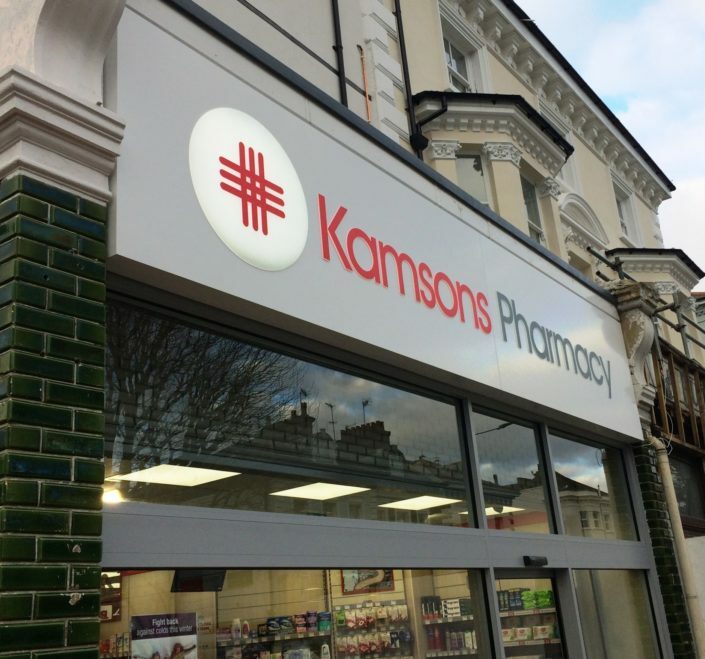 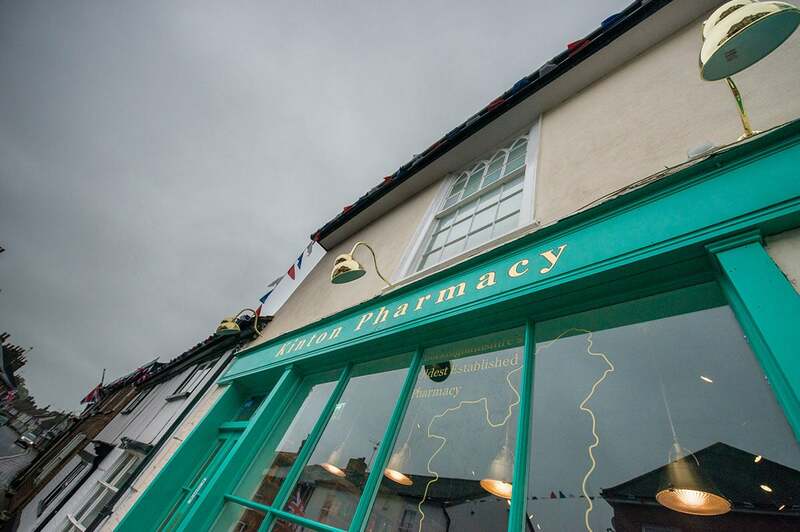 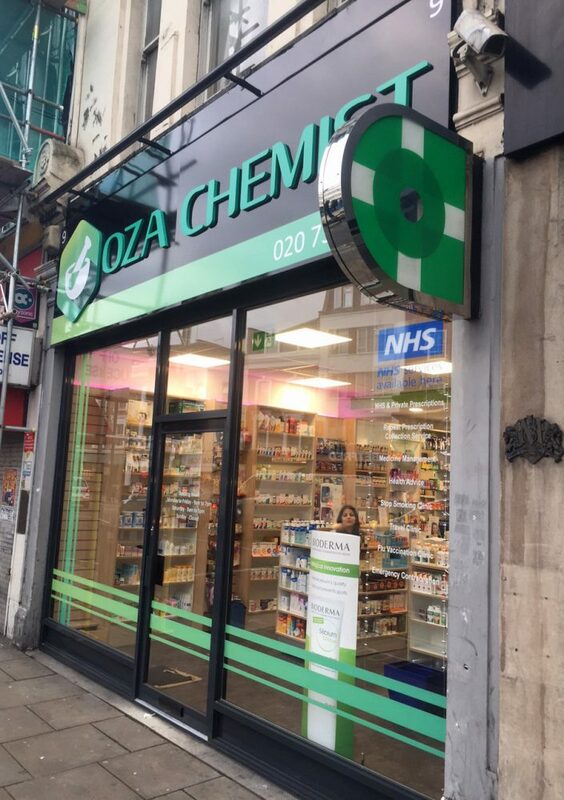 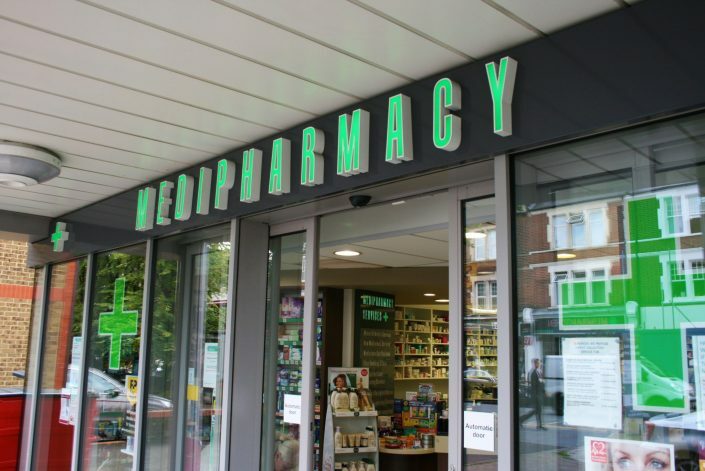 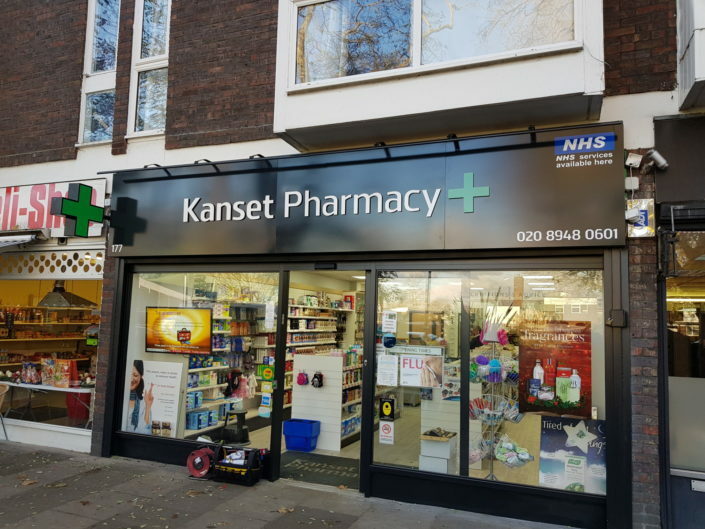 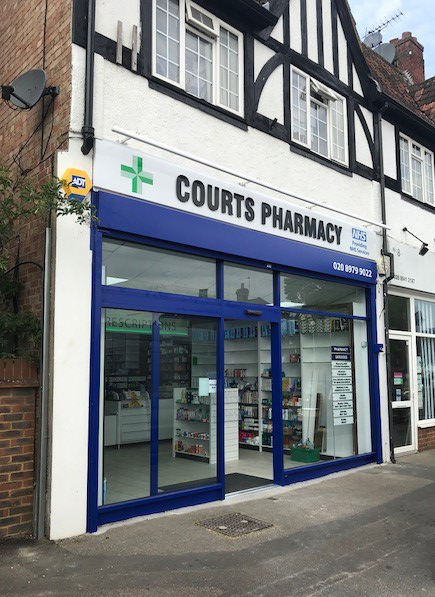 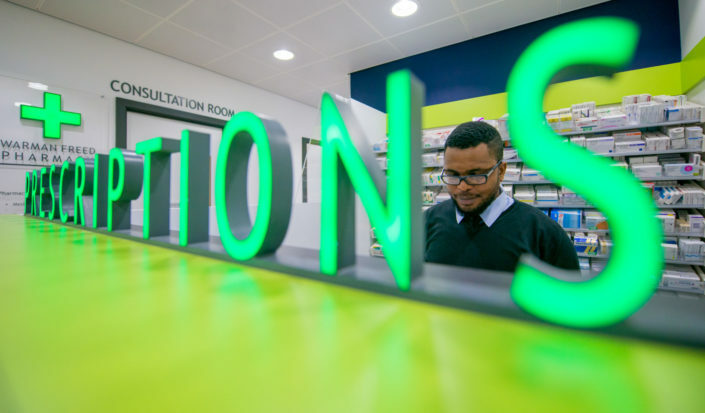 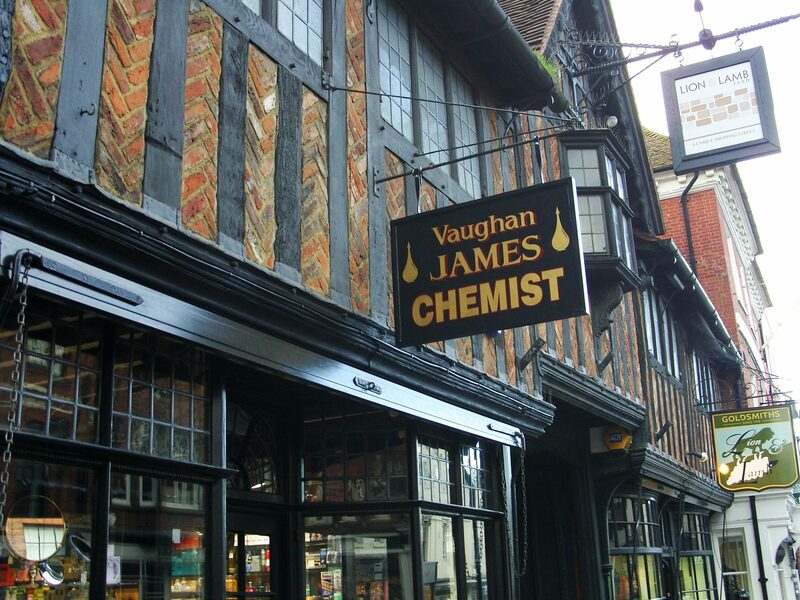 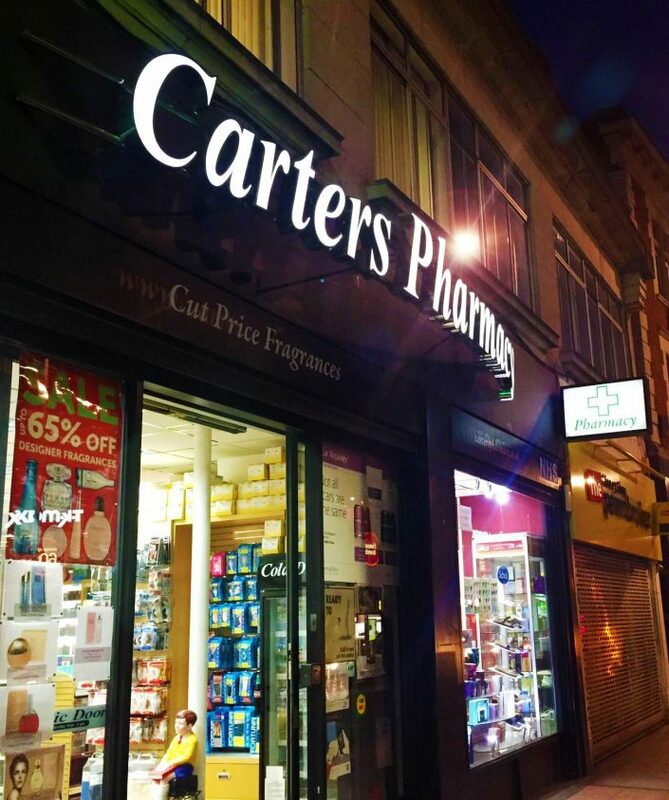 In addition to our bespoke Pharmacy signage, our ever growing list of ‘off the shelf’ products consisting of illuminating projecting crosses and illuminated acrylic wall/celling signs, demonstrates our investment to the NPS’s members, our clients and the independent community. 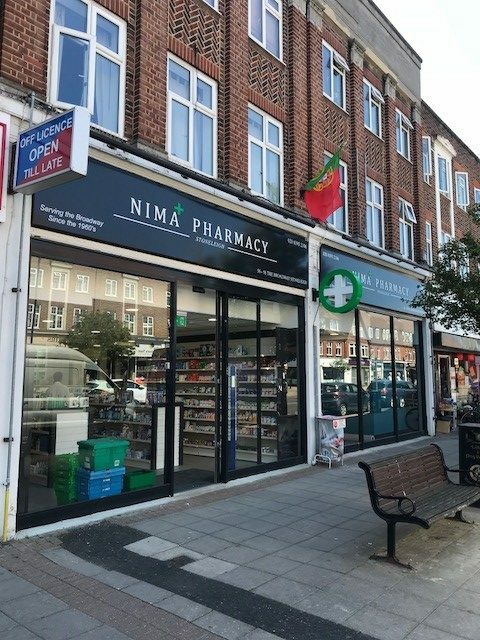 Partnering with National Pharmacy Association and working in conjunction with designers, retail fit-out companies or direct with the end-user client, Mood Signs Ltd have over the past four years dominated the market as the go-to company for pharmaceutical related signage. 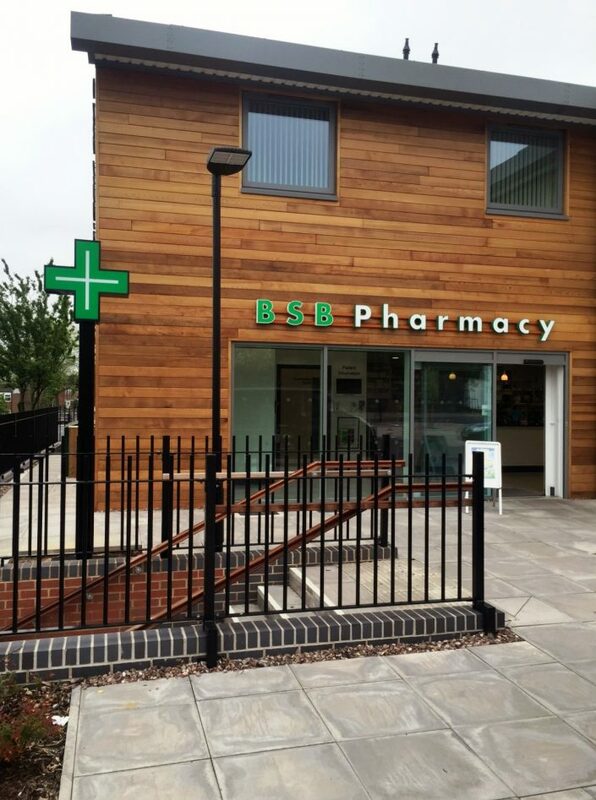 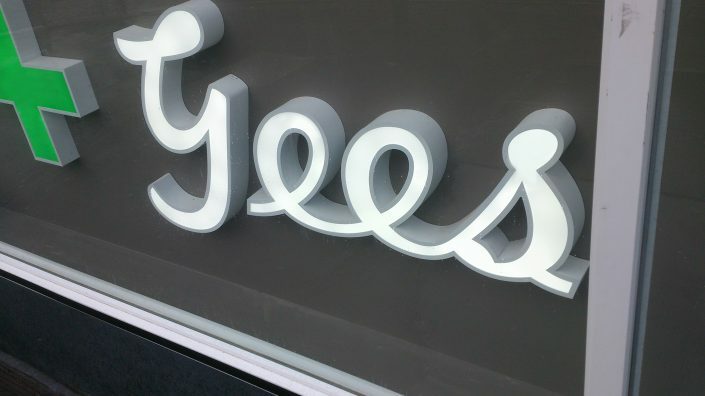 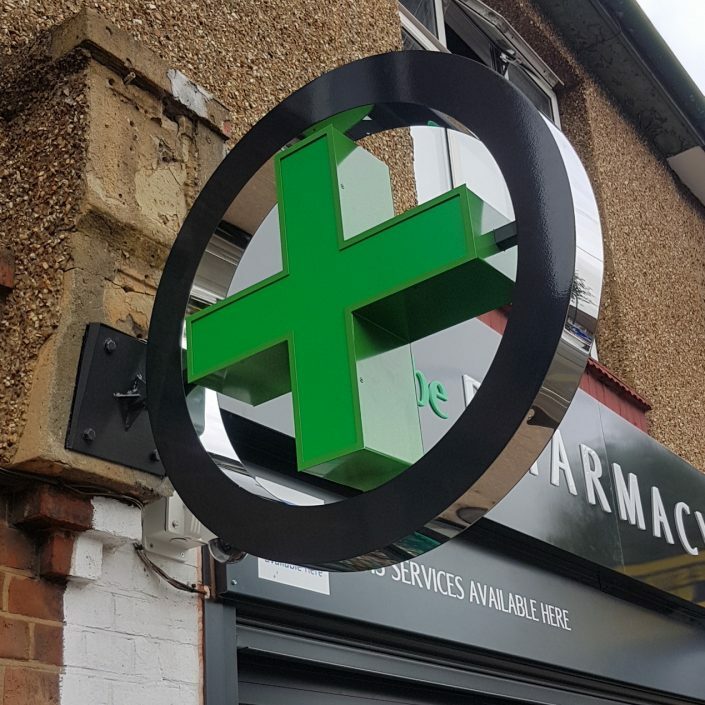 From pre-existing designs like the traditional and synonymous NHS logo or the notorious pharmacy green cross, to a more bespoke and unique illuminated LED variant, the Mood Signs design team will work with you offering endless possibilities and options to suit your requirement and budget. 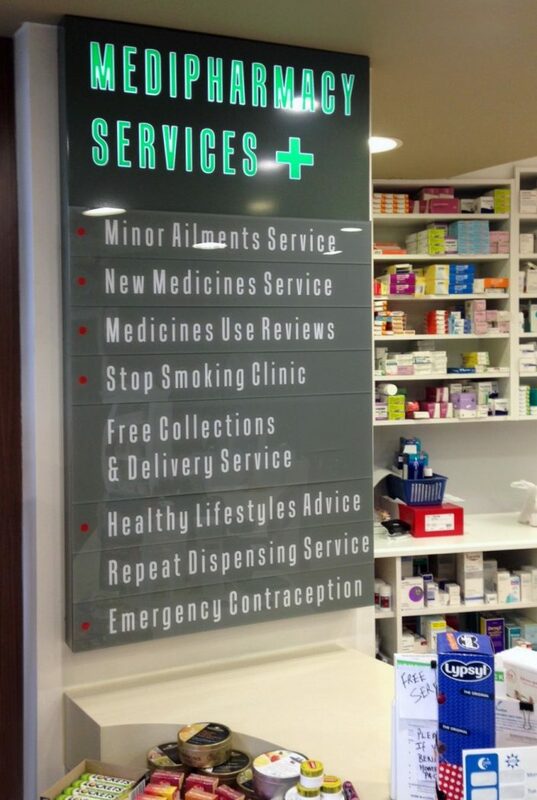 We have vast experience in creating striking, attention grabbing signage all of which complies with NHS branding guidelines. 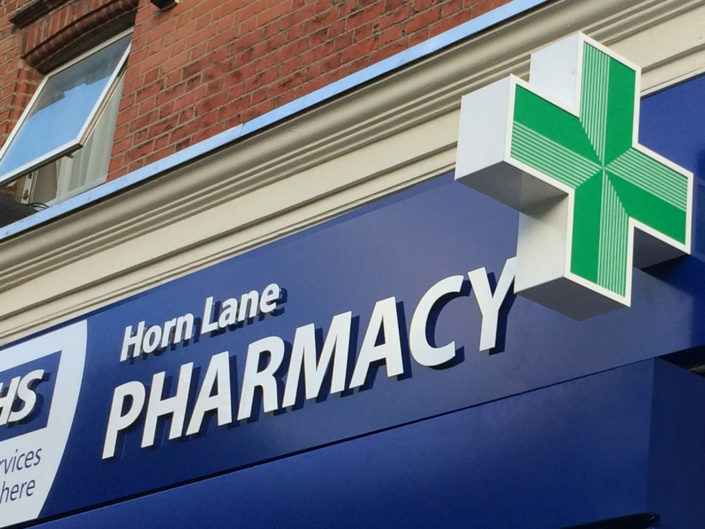 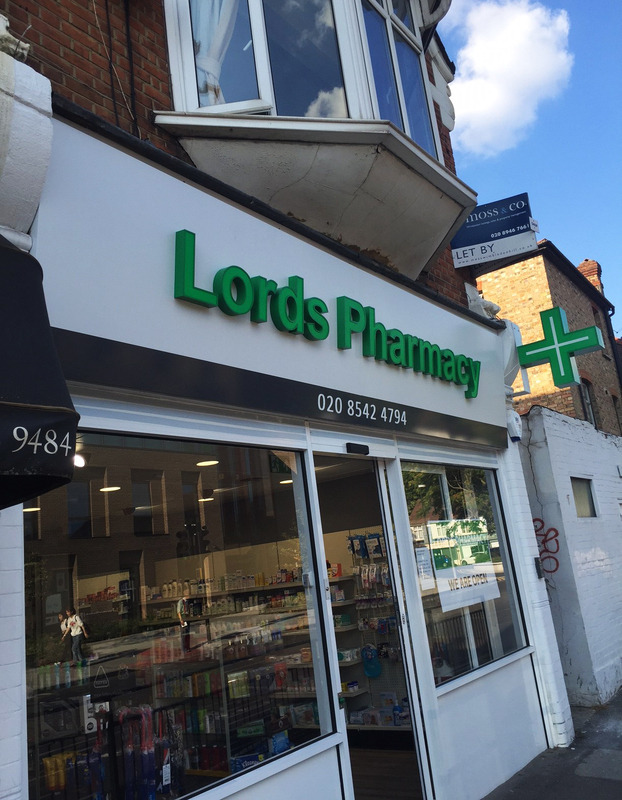 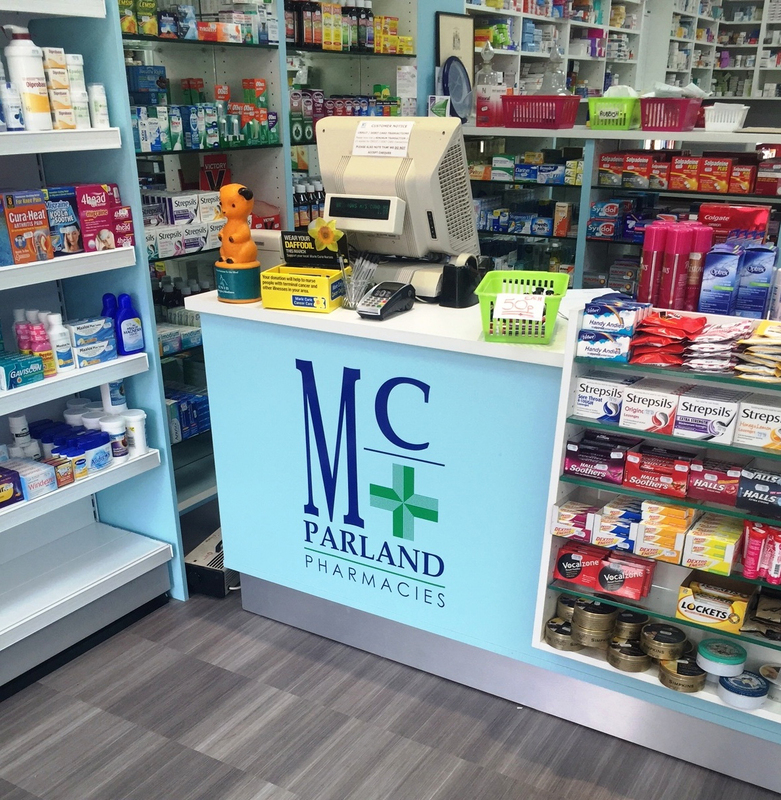 Technical: We design, manufacture and install a range of illuminated and non-illuminated signage intended specifically for pharmacies. 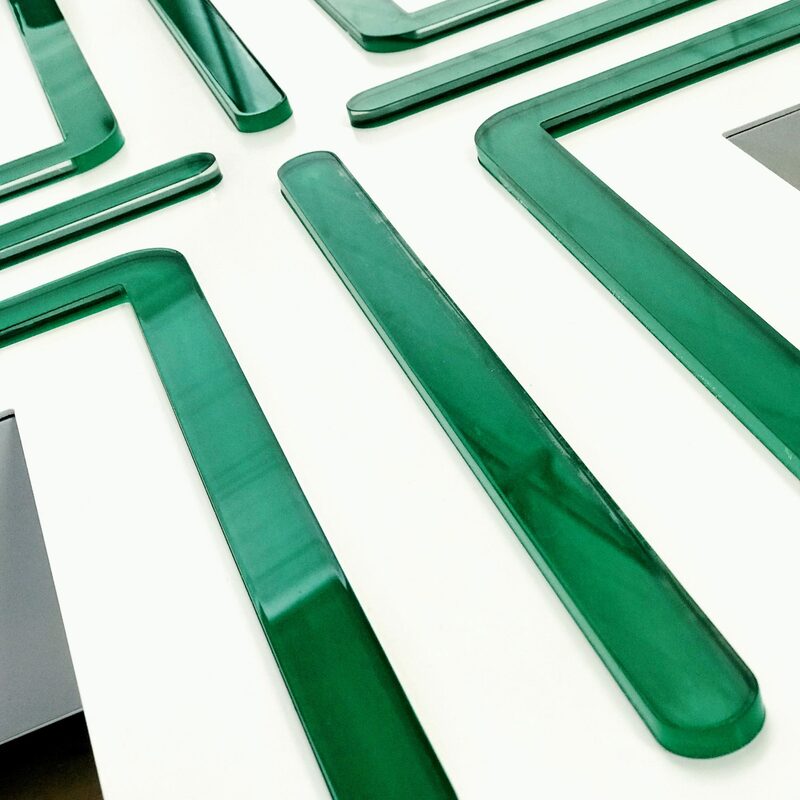 Our second-to-none design abilities coupled with our cutting edge technologies ensure you get the display that you require and your customers are able to identify you and the services and products you offer. 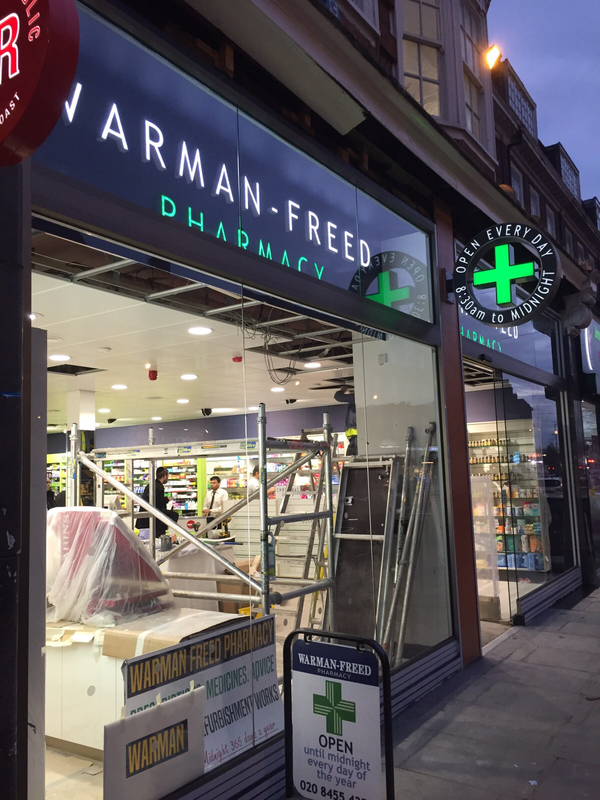 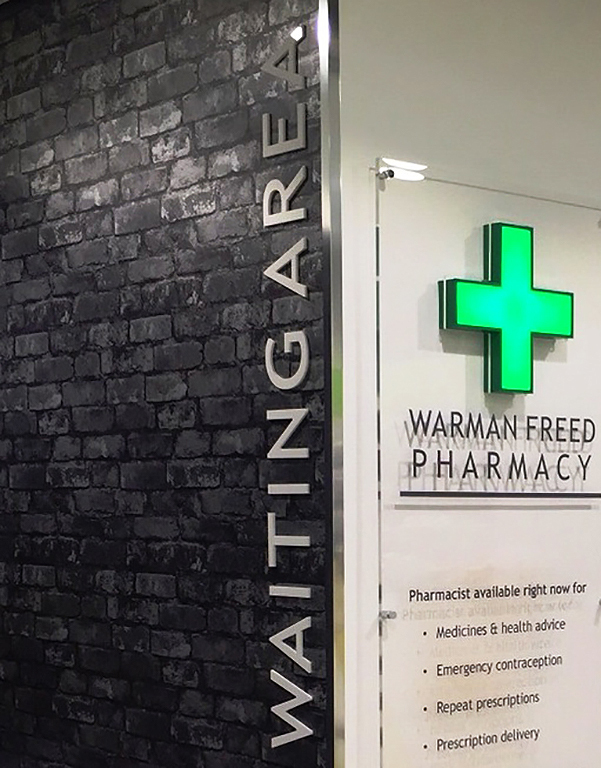 Case study: A prestigious signage project for our client Warman Freed Pharmacy utilised many of our most popular technologies. 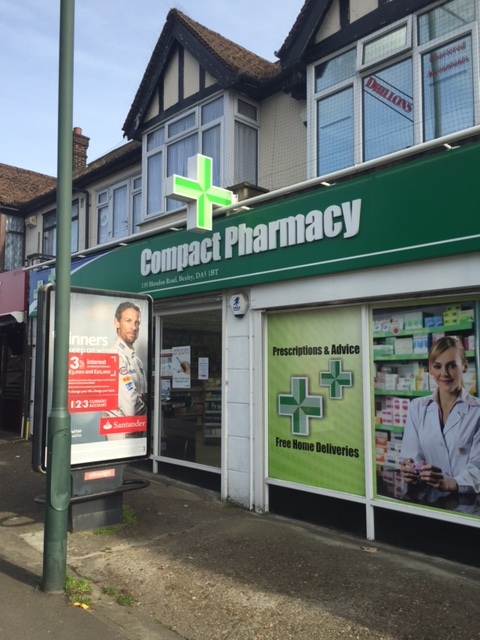 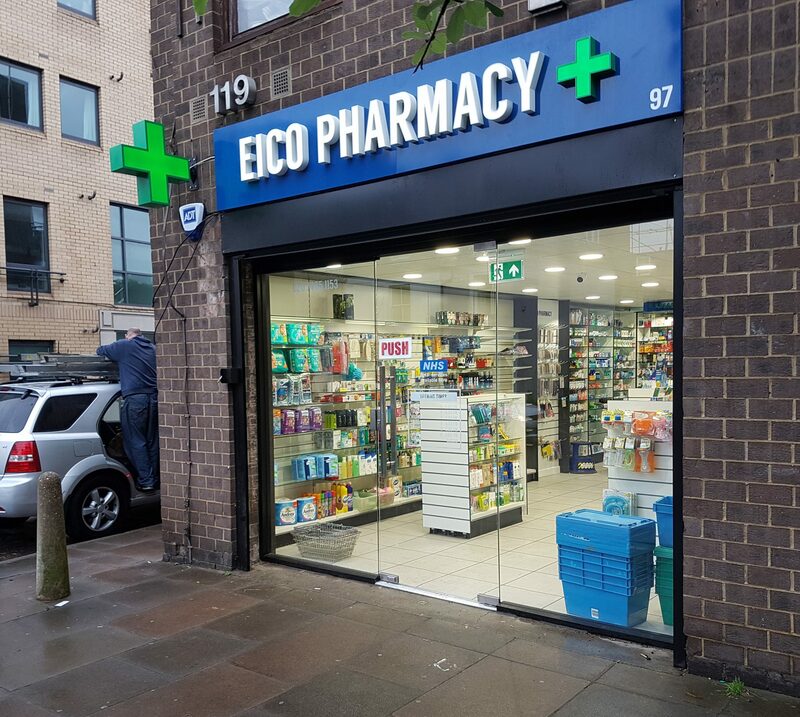 Internally illuminated rim and return aluminium letters were installed to an internal bulkhead alongside the requisite Pharmacy cross. Rolled polished stainless steel projecting signage combined with opal acrylic face panels, translucent vinyl and LED illumination gives a flawless finish to this specialised project. “Changing the Main Signage was necessary as our old sign looked very dated and didn’t really stand out to passers by. 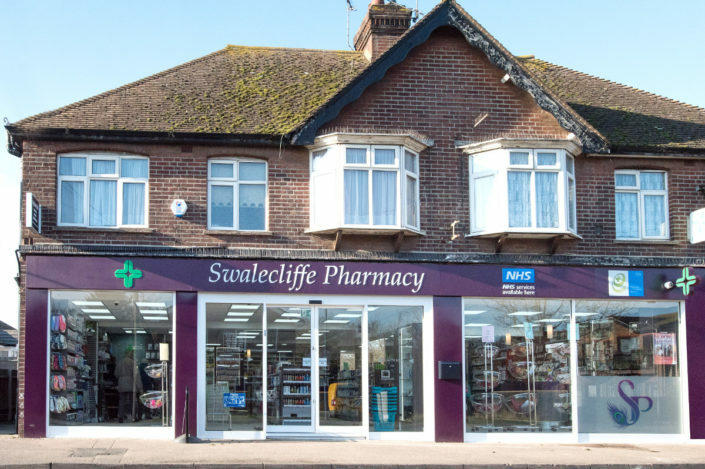 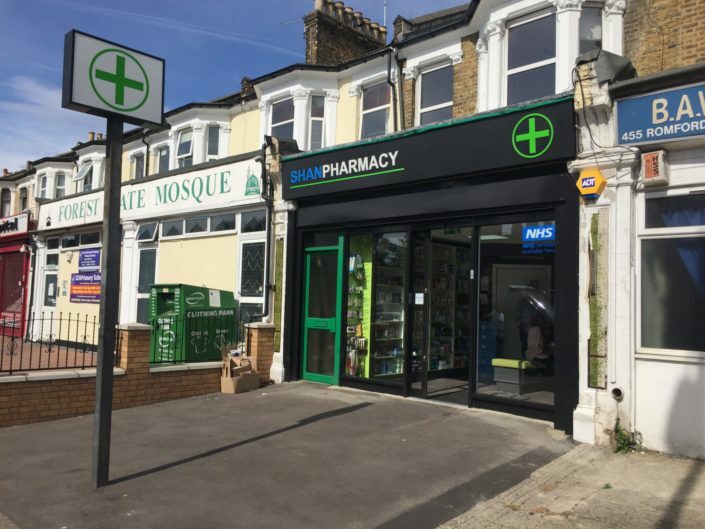 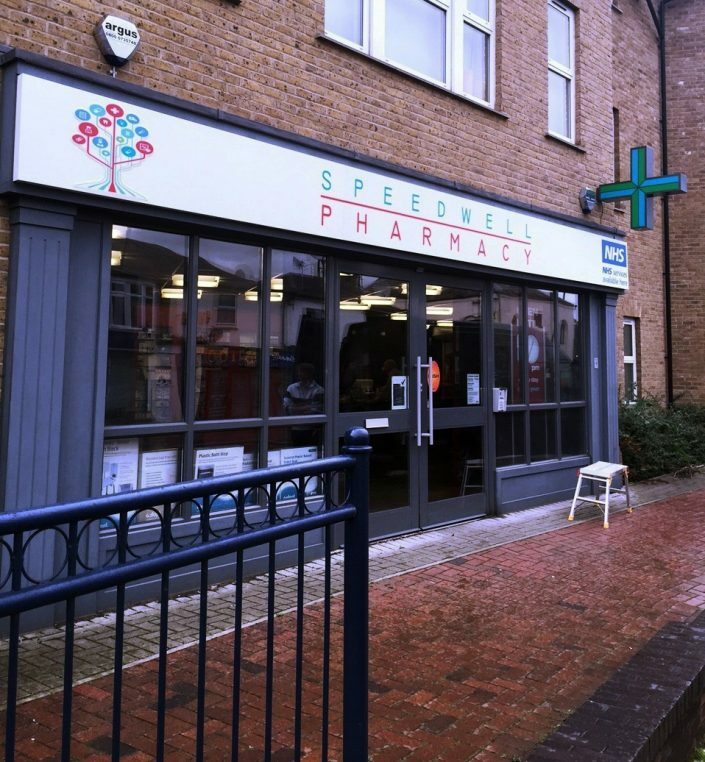 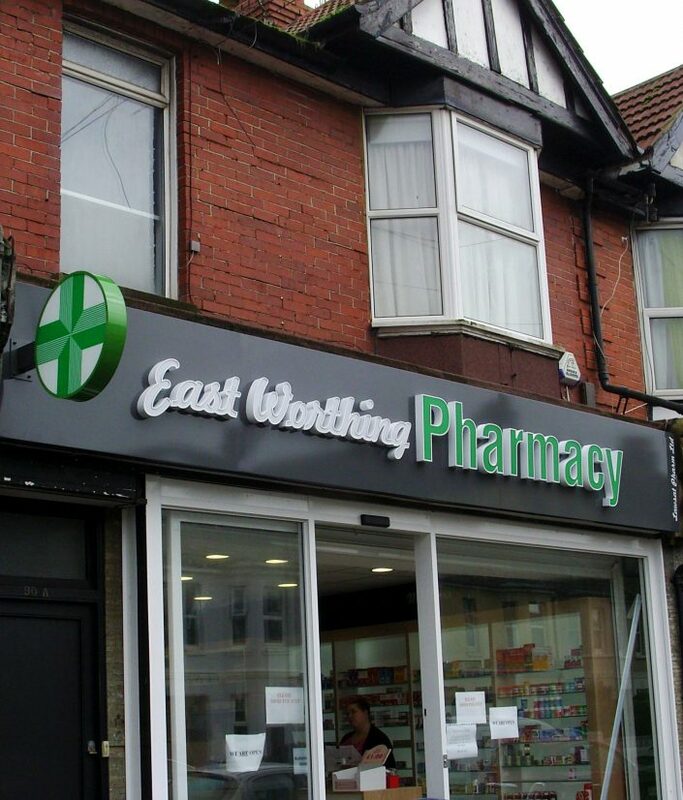 I really wanted the new signage to look classy but more importantly to really stand out and highlight the fact that we are a pharmacy and ravel clinic. 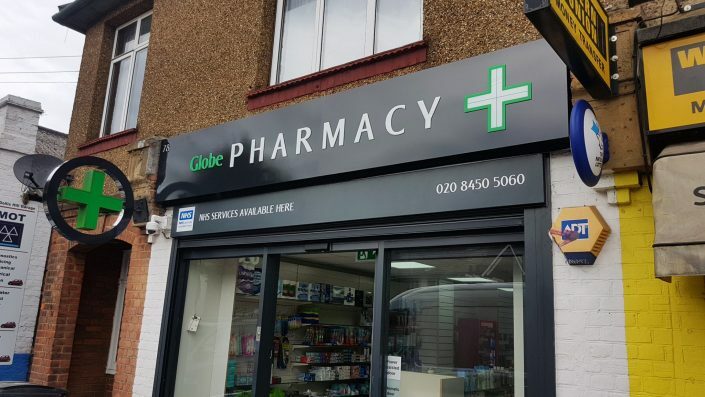 Mood signs have produced a spectacular sign in my opinion which really does stand out and I have received only positive feedback regarding the signage from my customers. 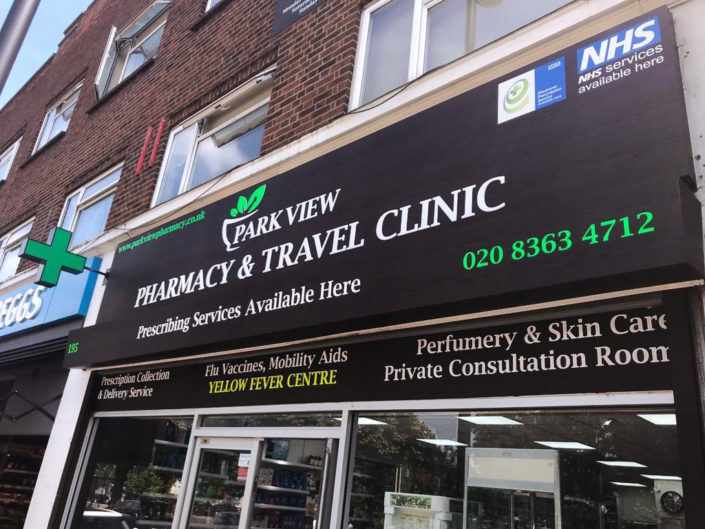 Within the first few days of the signage being installed, I noticed a surge in enquiries for the travel clinic service which we have been running since 2016. 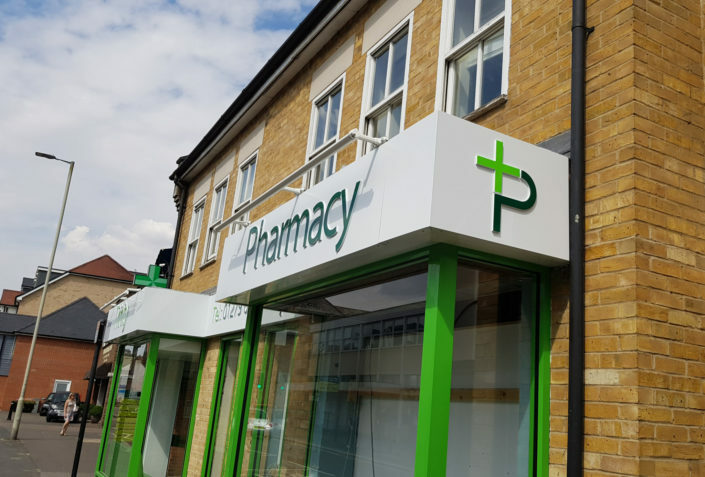 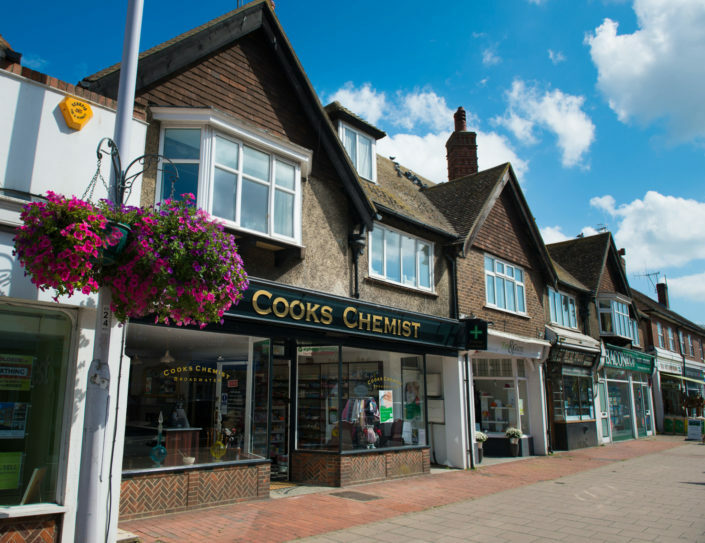 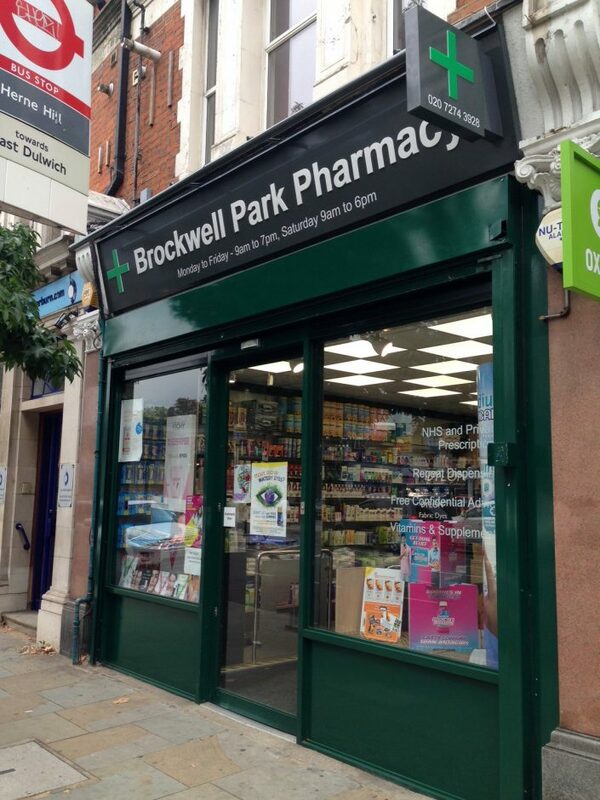 This has led to many more bookings for the travel clinic service than we had previously seen during either the summer of 2016 or 2017 and I would have to relate this to the installation of the new signage and the refit which we have just completed within the pharmacy. 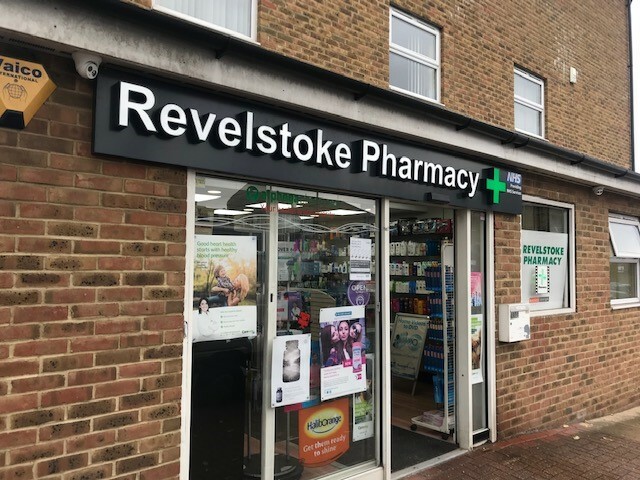 I believe that the investment in replacing the old sign will have been returned by the end of this year and we only had the signage installed in June 2018! 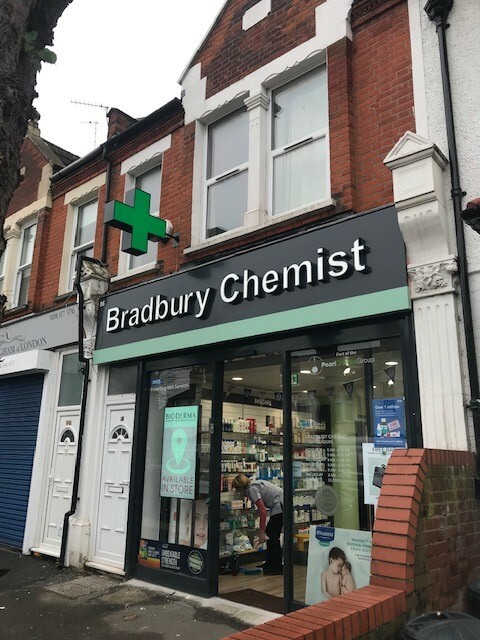 The quality and professionalism during installation and aftercare has been faultless from Mood signs and I really could not be any happier with my new signage”.